The windscreen wipers and the windscreen washer system only operate when the ignition is switched on. The rear window is wiped once automatically if the windscreen wipers are on when reverse gear is selected. Top up with windscreen wiper fluid » page 141. Properly maintained windscreen wiper blades are essential for clear visibility and safe driving » page 64. Do not use the windscreen washer system at low temperatures, without heating the windscreen beforehand. Otherwise the window cleaner could freeze on the windscreen and restrict the view to the front. Replace the windscreen wiper blades once or twice a year for safety reasons. These can be purchased from a ŠKODA Partner. In cold temperatures and during the winter, check before the journey or before switching on the ignition that the wiper blades are not frozen to the windscreen. If the windscreen wipers are switched on when the blades are frozen to the windscreen, this may damage both the blades and windscreen wiper motor! If the ignition is switched off while the windscreen wipers are switched on, the windscreen wipers will continue wiping in the same mode after the ignition is turned back on. The windscreen wipers could freeze up in cold temperatures between the time the ignition was turned off and when it was turned back on again. Carefully detach frozen wiper blades from the front or rear window. Remove snow and ice from the windscreen wipers before driving. If the windscreen wipers are handled carelessly, there is a risk of damage to the windscreen. The windscreen washer nozzles for the windscreen are heated when the engine is running and the outside temperature is less than approx. +10 °C. The content of the windscreen washer fluid reservoir is 3.5 litres. On vehicles fitted with the headlight cleaning system, the volume is around 5.4 litres. The wiper blades should be cleaned on a regular basis with a windscreen cleaner to avoid any smears. The wiper blades should be cleaned with a sponge or cloth if they are heavily soiled by insect residues, for example. Control stalk positions » Fig. 50. The wash system operates immediately, the windscreen wipers wipe somewhat later. 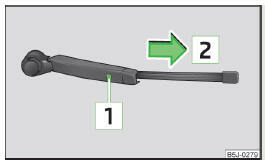 Releasing the lever will stop the windscreen washer while the wipers continue for another 1 to 3 wiper strokes (depending on the period the windscreen has been sprayed). The wash system operates immediately, the wiper wipes somewhat later. 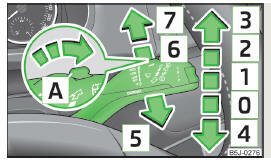 Releasing the lever will stop the washer while the wipers continue for another 1 to 3 wiper strokes (depending on the period the window has been sprayed). The lever will stay in position after releasing it 6 . The headlights are sprayed briefly if the low beam or main beam are switched on and the windscreen wiper stalk is pulled to position 5 » Fig. 50 on page 63. To clean the headlights, the windshield is also sprayed after every five squirts. You should remove stubborn dirt (such as insect residues) from the headlight lenses at regular intervals, for example when refuelling. The following guidelines must be observed » page 132, Headlight lenses. To ensure the proper operation of the cleaning system during the winter, any snow should be removed from the washer nozzle fixtures and ice should be cleared with a de-icing spray. Never remove the nozzles from the headlight cleaning system by hand – there is risk of damage. Lift the windscreen wiper arm away from the windscreen. Press the locking button 1 » Fig. 51 and remove the wiper blade in the direction of arrow 2 . Push the wiper blade in until it latches on the stop. Check that the wiper blade is correctly attached. Fold the wiper arms back to the windscreen. Windshield wiper blades in proper condition are essential to obtain good visibility. Wiper blades should not be allowed to become dirtied by dust, insect remains and preserving wax. Juddering or smearing of the wiper blades could then be due to wax residues left on the windshield by vehicle washing in automatic vehicle wash systems. Raise the wiper arm away from the window » Fig. 52. Tilt the wiper blade to the stop in the direction of the wiper arm. Hold the upper part of the wiper arm and unlock the securing mechanism 1 . 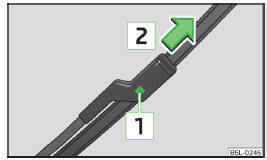 Remove the wiper blade in the direction of the arrow 2 . Fold the wiper arm back to the windscreen.